“There is a utopian perfection in inverting time,” explains South African artist William Kentridge. Time and how film changes time and the material world, which he as a visual artist is deeply connected to, are a focus of his drawings and videos. He sees the ability to use film to reverse and control time as connected to “the longing to undo things we’ve done.” Although he may not have achieved this form of utopianism in his performance opera, Refuse the Hour, presented by A.C.T. at the Geary Theater this past weekend, he and his talented team of artists, dancers and musicians certainly achieved a kind of surrealist perfection. The opening scene from William Kentridge’s performance opera, “Refuse the Hour”, at ACT’s Geary Theater. Photo by John Hodgkiss. The 80-minute-long piece is comprised of a series of episodes that are linked and introduced by short lecture-like commentaries by Kentridge. These mini lectures trace the perception of time through human history, moving from mythology to Newtonian mechanics through Einstein’s relativity to the End of Time, represented by black holes, as Kentridge defines them: both those that exist in space and those that are here, waiting for us at the end of our lives. Many of these lectures were drawn from conversations between Kentridge and Peter Galison, a professor of the History of Science and Physics at Harvard University. Galison is listed as the dramaturg for Refuse the Hour. It is art, though, rather than science that lies at the heart of Kentridge’s work. His task was how to solve the problem of making “something so immaterial as time into something palpable.” And it was to music and dance that Kentridge first turned, meanwhile employing his superlative drawing skills to create a landscape to reflects back and reconfigure music and movement into a visual panorama. 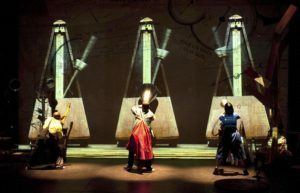 Kentridge along with longtime collaborator Catherine Meyburgh devised the film sections that combined so seamlessly with the onstage action. Refuse the Hour opens with a drum set suspended high above the stage banging away. Simply at first, as if it were repeating the tick of a large clock, and then becoming increasingly erratic and syncopated as all the instruments in the set are put into motion, mechanically and without apparent human agency. Three huge metronomes projected onto a more anonymous background of sketches and erasures click away at different rates. Stage left, the six-member band honks and bangs and rasps away, brilliantly, in a mad version of Kurt Weill meets Tristan Tzara. Philip Miller was the composer-arranger and Adam Howard was the director-conductor on flugelhorn and trumpet. Sound design by Gavan Eckhardt enhanced the action throughout. Into the world of metronomes and whirling apparatuses appeared actors and singers, lugging huge shiny cones of megaphones. Soprano Joanna Dudley performed a mind-boggling series of vocal techniques, underlining and echoing both the musicians and Ann Masina, who sang a Berlioz art song from the boxes high above the stage. Add to the mix the gorgeous dancer-choreographer Dada Masilo, who is the perfect foil to Kentridge’s professorial delivery, and that sums up the players. All of their prodigious talents combined into a “hullabaloo” that moves between words – spoken, sung and written – and movement from the gymnastic to the mechanical to the theatrical, staggering from the operatic to the cosmic. Refuse the Hour solves no mysteries of time, but it fulfils its own time on stage with the fascinating and the miraculous.